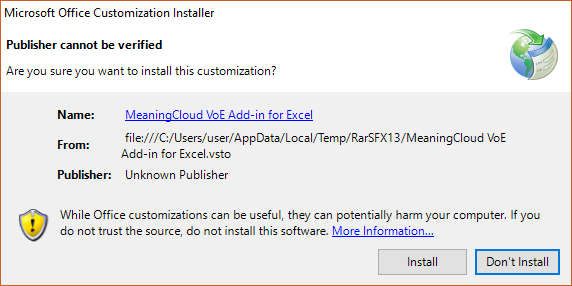 Follow these steps to setup the MeaningCloud VoE Add-in for Excel in your environment and start working. 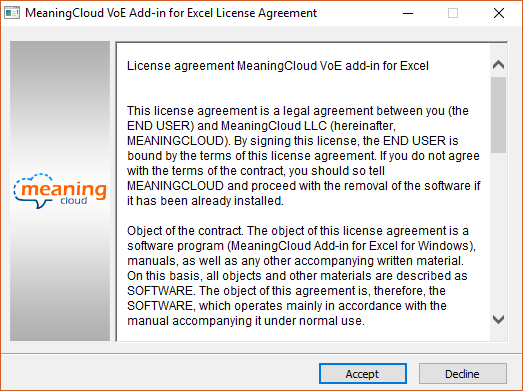 Just click on the following link to download the MeaningCloud VoE Add-in for Excel and when prompted, save the zip file with the add-in to your computer in the folder of your choice. An Excel addin can be removed as any other program installed in your computer: you just have to go to Control Panel\Programs\Programs and Features, select the addin from the list of programs and features (it appears as MeaningCloud VoE Add-in for Excel) and then click on the Uninstall button.